Beginning tomorrow, the 2015 Open Championship will kick off in the town that epitomizes golf: St. Andrews, Scotland. This year’s event on the storied Old Course is likely to generate more interest than ever, with an untold number of great storylines in the making. Will Jordan Spieth earn his third straight major of the year and keep his Grand Slam hopes alive? Will Tiger Woods return to form on the course where he has twice won The Open?—and put the golfing world on notice that The Stripèd One is back? Will Rickie Fowler carry momentum from his Scottish Open win at Gullane forward onto golf’s most historic links? And will five-time winner Tom Watson make the cut—or dare to contend!—in what he has said will be his final Open Championship? Golf fans from across the world will be making their way to St. Andrews to learn the answers to these questions. The unfortunate ones will have to resort to staying far out of town and ride shuttle buses to get to the event. The more fortunate fans will have reserved a luxurious room or suite at The Old Course Hotel & Spa, by far the best hotel in St. Andrews. From the balconies of those elegant and beautifully appointed rooms, they’ll have a bird’s-eye view of play on the 1st, 2nd, 17th and 18th holes. But the most fortunate fans of all will be watching play from behind the 18th green, from the posh confines of the 6th-floor terrace of the Hamilton Grand. This beautiful and historic building, which sits just behind the 18th green of the famed Old Course, is probably the second most photographed building in the world of golf (after its distinguished neighbour, the clubhouse of the Royal and Ancient Golf Club). But what you’ll see from the outside is only the beginning. Hamilton Grand’s distinctive bell-shaped dome and distinguished sandstone exterior are but the slightest hints at the luxury and beautiful architectural design that lies within. The hotel quickly rose to stardom. It was the first building in Scotland to have a pneumatic elevator connecting the seven floors, and the first Scottish hotel to have hot and cold water running in every room. It set the benchmark for the ultimate in luxurious hospitality. Of the £80,000 invested in its construction, £20,000 was spent just on ‘furnishings and décor.’ It was indeed a ‘grand’ hotel on every scale. As the Grand entered the 20th century, its appeal only grew. It played host to Royalty—the then Prince of Wales (later Kind Edward VIII) enjoyed exclusive use of the building when visiting St Andrews. Many celebrities of the era, including Mary Astor, Douglas Fairbanks, Rudyard Kipling and Bing Crosby, gave the Grand their custom. It also housed the U.S. Walker Cup and Curtis Cup Teams and hosted every major player competing in The Open Championship right up until the Second World War. In 1942, the Grand Hotel was requisitioned by the Royal Air Force to serve as its training headquarters. Shortly after the War, the University of St. Andrews acquired the building and opened it as a dormitory under the name Hamilton Hall, after the Duke of Hamilton—then Chancellor of the University. For 56 years, it served the very lucky St Andrews’ student body faithfully. The University closed the Hall in 2005 and, after one failed redevelopment attempt, the property fell into serious disrepair. 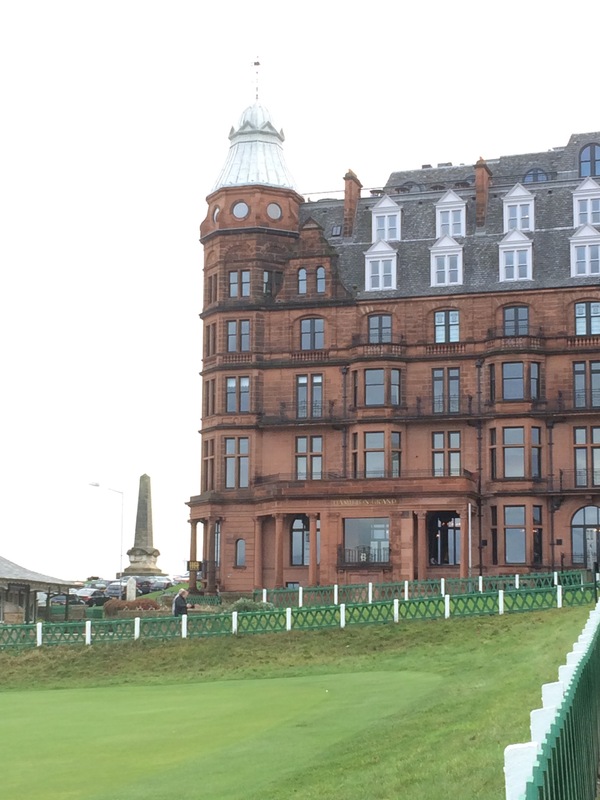 In 2009, the building was acquired by Kohler Co., owner of the neighbouring Old Course Hotel, Golf Resort & Spa. Within weeks of purchasing Hamilton Hall, Herb Kohler, Jr., Chairman of the Board and CEO, hosted two days of receptions to which he invited the people of St Andrews to come and learn about the exciting restoration plans. The building was renamed ‘Hamilton Grand’ in memory of its founder and as a tribute to its rich history. Between 2010 and 2013, Kohler Co. undertook an incredible restoration project, recapturing the property’s Victorian grandeur. It has now been transformed into a collection of 26 homes of distinction—two-, three- and four-bedroom apartments ranging in size from 1,133 to 2,780 square feet. Additionally, this magnificent building features a private lounge for residents, a stylish bar and a restaurant, Ham’s Hame, where a dining table or seat at the bar will be in great demand during this week’s Open. The attention to detail throughout the building is magnificent. From the drawing room, with its ornate fireplace and comfortable (and convivial) lounge seating, to the interiors of the residences themselves, no expense was spared to make Hamilton Grand the grandest of all apartment residence buildings. Mr. Kohler’s wife, Natalie, was instrumental in helping to drive those architectural and design decisions. The result truly has to be seen to be believed. David Scott, Director of Operations at The Old Course Hotel (and one of Scotland’s tallest and most capable golfers) explained that the philosophy behind Hamilton Hall in many ways mirrors that of the luxury hotel it’s associated with. There’s no doubt that here in St. Andrews, Hamilton Grand is the ultimate residential address and experience. It’s a golfer’s dream made true and, from the spectacular 6th floor terrace, it will undoubtedly provide what is, without question, the best view in golf this week. Whatever storyline is written, Hamilton Grand residents will enjoy an unmatched view of it. David DeSmith is a New England-based writer and marketing professional who did bloody battle in the advertising industry for several decades before escaping to focus on golf and launching two regional golf magazines, Golf of Maine in 1998 and the New England Journal of Golf in 2001. David served as publisher and editor of both publications, while also writing feature articles on topics ranging from golf travel and course design to the people who play the game and the equipment they use. He also occasionally writes about music, if the spirit moves him. Bumper Crop of Golf Bumper Stickers! R&A, Muirfield to admit women members?